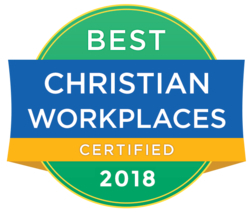 MERCER ISLAND, Wash., Jan. 29, 2018 /Christian Newswire/ -- The Best Christian Workplace Institute (BCWI), today, announced that 177 organizations have been named as "Certified Best Christian Workplaces" for 2018. The honorees—including 68 churches, 57 parachurch ministries and 26 companies—is the highest number of healthy-to-flourishing organizations to receive "Certified" status since 2002, when BCWI introduced its Staff Engagement Survey, now the widely-used standard for pinpointing the health of a faith-based workplace culture. This new record-number of organizations is 20 percent higher than the number of certified honorees in 2017. "This increase underscores the growing consensus among Christian leaders to listen to, and then act upon, the reliable, insightful feedback of their employees," says BCWI President Al Lopus. "More organizations are now surveying on a regular basis, a credit to leaders who recognize that a thriving workplace culture equates to greater productivity, organizational impact, and stakeholder loyalty." Speaking at a recent national conference, Lopus noted that organizations with unhealthy workplace cultures can risk losing quality talent, only to spend $20,000 to $40,000 to recruit and hire a new employee. The BCWI Staff Engagement Survey is the only available online resource of its kind that offers Christian-based organizations a true, objective, quantifiable measure of its workplace culture health. Certified organizations demonstrate a benchmark survey score based on eight distinctive factors that drive a flourishing workplace culture. All survey participants are ensured complete anonymity. BCWI is an international non-profit, research-based, organizational development and human resources consulting firm, with head offices in Mercer Island, WA. BCWI's mission is to equip and inspire Christian leaders to build a flourishing workplace. For more information, visit Best Christian Workplaces Institute online: www.bcwinstitute.org. Each week, benefit from the proven, practical best practices from top Christian leaders on the Flourishing Workplace Blog (blog.bcwinstitute.org) and the Flourishing Culture Podcast (blog.bcwinstitute.org/podcast).